There's a special place in my heart for African publishers, and the work they do. Recently I came across The Small Publishers' Catalogue, 2013 which will be produced by the South African publishers Modjaji Books, who I showcased last year. This is an updated version of one which was produced in 2010. 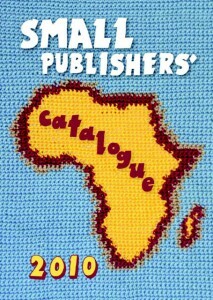 The 2010 edition "was a first attempt at collating small or indie African publishers'. It had 43 publishers, which were mainly South African, sold and distributed 500 copies, and its online version has had over 4200 visits. But according to Colleen Higgs, publisher and founder of Modjaji, "it was rather limited and had enormous gaps in it". Based on that, this new edition "is designed to be more comprehensive".
" ... Many people not even those in the book world, such as librarians, booksellers, larger publishers, and books page editors are not aware of the extent and fertility of this part of the book world ... The Small Publishers Catalogue is a way of letting more people know about the work of independent and small publishers in Africa. Unless the information is collated it is difficult to find contact details or to know who is involved and who is doing what and where. ... There are lots of publishers who do amazing work, getting out the stories and experiences and writings of people all over the continent which enable us to understand our worlds and ourselves differently. By putting all of these publishers onto the radar of all of those who are interested, you will assist in growing readership, and in funding these publishers in a sustainable way". As someone who is a lover of African books and a big supporter of local publishing houses, I think this is a beautiful initiative and I absolutely love that Colleen Higgs and Modjaji are putting together a catalogue that showcases the diversity of the African publishing industry. I for one cannot wait for it to be released. While the Indiegogo campaign is finished, if anyone is interested in learning more about, or supporting, this campaign, definitely check it out here and you can see the 2010 catalogue online edition here.